It all seems to matter this year in Three Rivers League boys basketball play. That certainly seemed to be the case when Tualatin faced Oregon City on Friday — wow, did it ever. 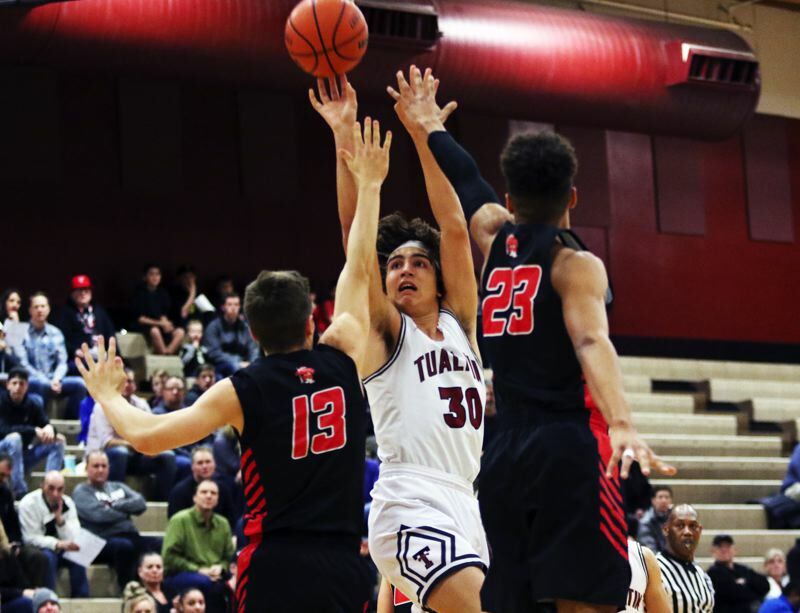 In a hard-fought contest, where neither team ever led by more than five points in the second half, and where the outcome wasn't decided until the final couple of seconds ran off the clock, the Pioneers came away with a 61-60 victory in a TRL thriller played at Tualatin High School. 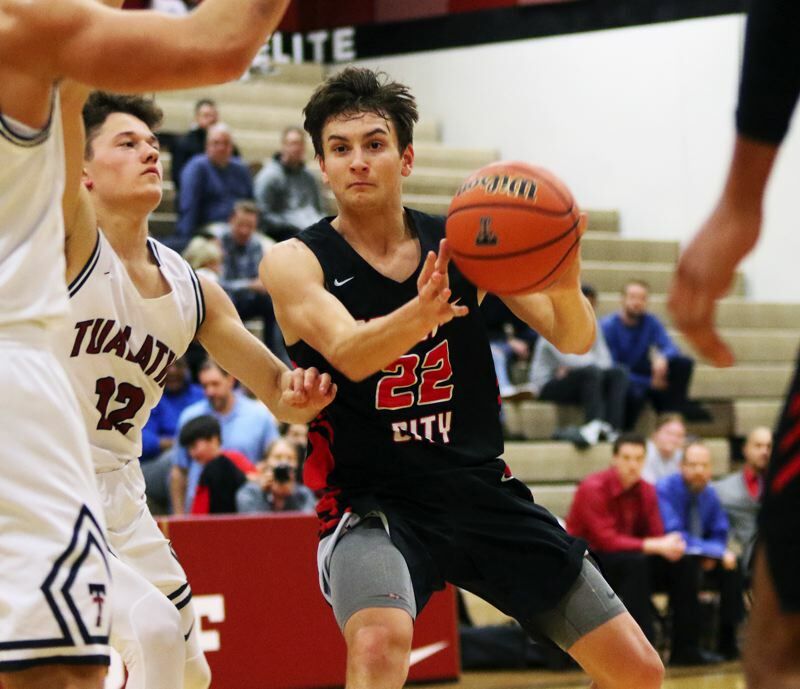 "It was good," said Oregon City senior post Erich Nova, who scored 10 of his 14 points in the third quarter of the contest. 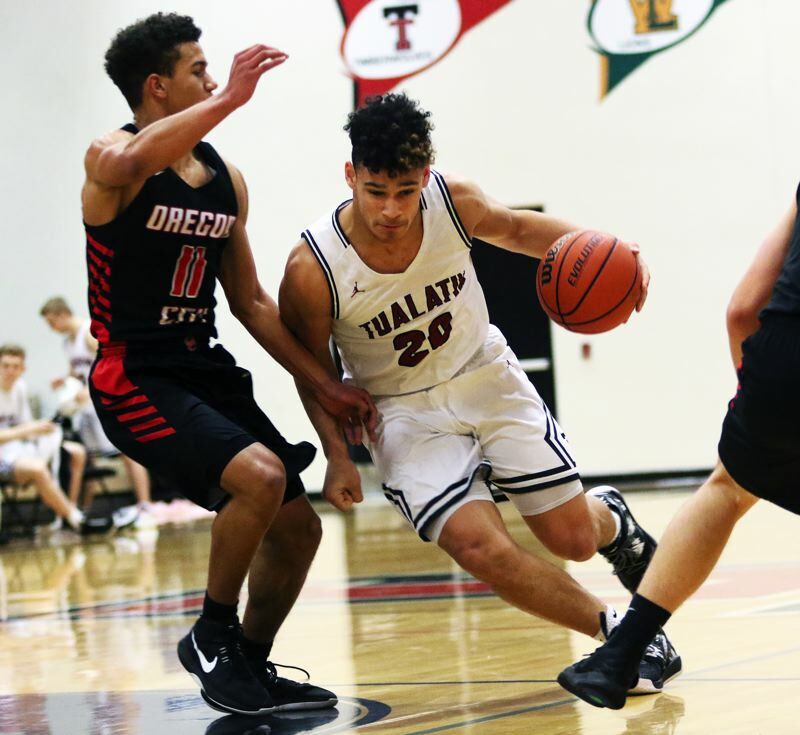 "Tualatin is a really good team with good players. It was difficult. We were down, but we came back, and that was a good thing." 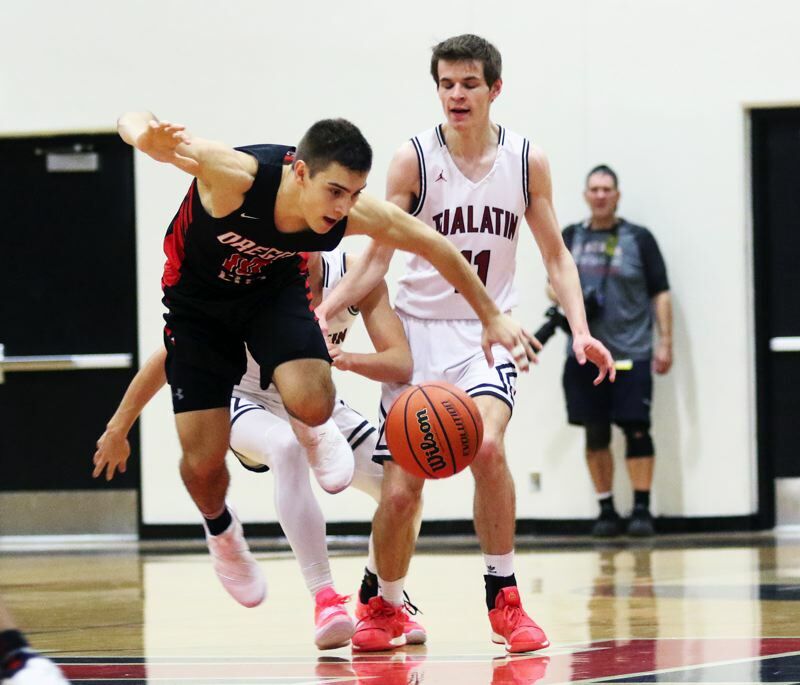 "We definitely fought," said Tualatin senior guard Caden Dickson, who led the Timberwolves with 19 points. "We competed, and we know we can stick with those teams. 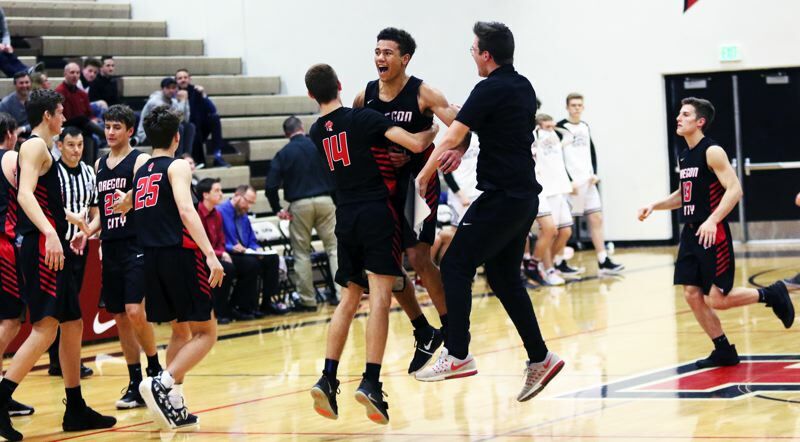 When we play them there, at Oregon City, we'll have to do that extra work, which will get us that win." With the win, Oregon City improved to 2-1 in TRL play (11-4 overall), putting the Pioneers in fourth place in the league standings. "This league is different," Nova said. "Great competition, so it's going to be harder, but we'll have to battle through it and keep playing." 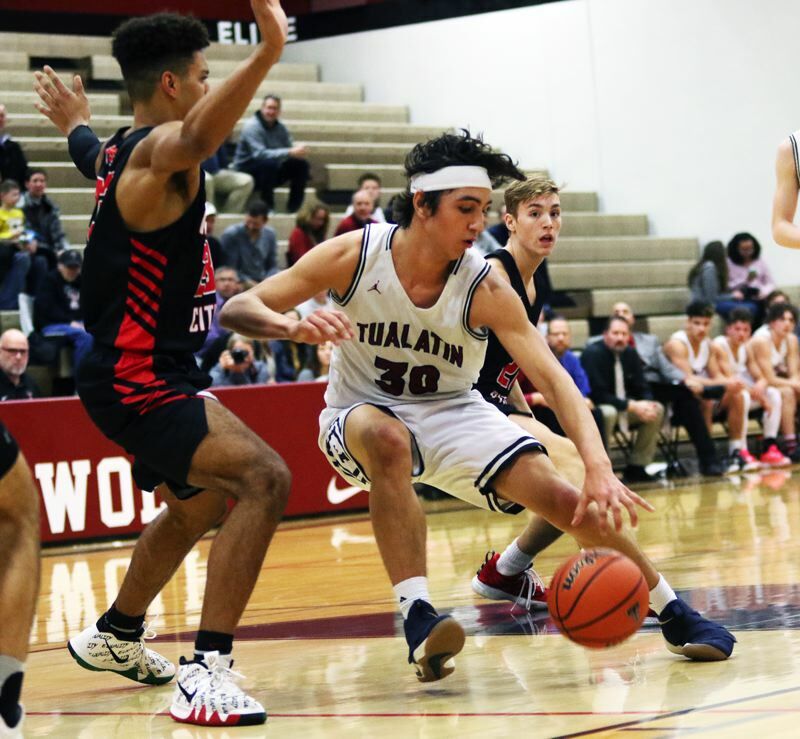 Tualatin moved to 0-3 in TRL games (8-6 overall), putting the Wolves in sixth place in the league standings. 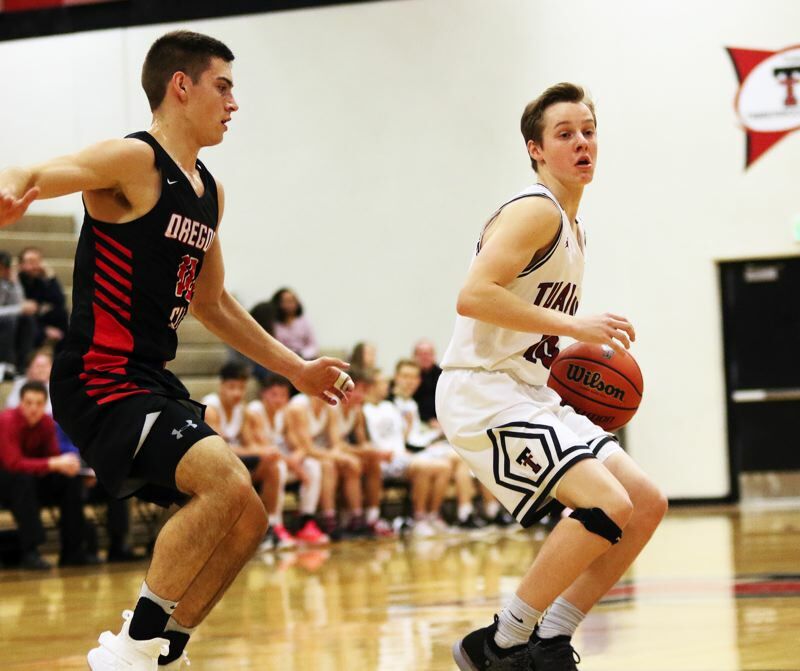 "They were hitting tough shots," Tualatin senior post Bridger Steppe said. "It was tough. We hate to lose, especially back-to-back games, by two (67-65 at home against West Linn on Wednesday), and then one. It's like that every night. We have to get two next week. We're going to come back and work harder, and that starts in practice tomorrow." The Pioneers got off to a strong start to Friday's game. 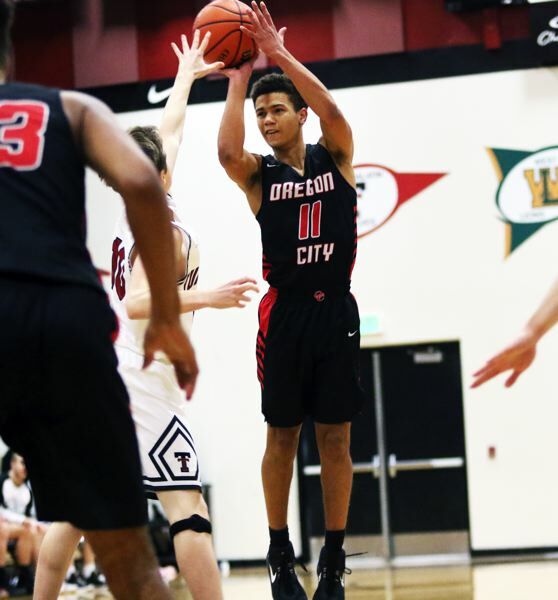 Oregon City junior Jake Gettel opened the game with a 3-point basket, and junior Andre Best and senior Corban Remsburg each scored five points in the first quarter, helping the Pioneers claim a 15-8 lead at the end of the opening period. But Tualatin came storming back, in a big way, in the second quarter. Following a Pioneer basket on a short-range turnaround jumper by Nova, Timberwolf junior John Miller sank a pair of free throws and then followed that up with a layup off a pass by senior Jason Wisler, cutting the Oregon City lead to 19-16 with 4 minutes and 59 seconds remaining before halftime. The Wolves would get even closer, following a pair of free throws by Remsburg, Dickson sank a 3-pointer and then immediately had a steal and layup, tying the game at 21-21 with 3:56 left in the period. Tualatin would then take its first lead of the game, at 24-23, on another 3-pointer by Dickson, coming with 3:18 remaining in the second quarter. The Wolves, getting four straight points by Steppe, a follow-up hoop by senior Jack Rose, and a basket on a drive to the hoop by junior Sam Noland, would go on to take a 32-29 lead to halftime. But Oregon City, and Nova, would come back strong after the break. Nova would score 10 points in the third quarter, shooting at a 5-for-5 clip from the field, while also grabbing a pair of rebounds in the period. "I was just playing basketball, and it just came to me," Nova said with a smile, referring to his third-quarter performance. Best and junior Dalton Welch added 3-pointers for Oregon City in the period, helping the Pioneers take a 47-43 lead into the fourth quarter. 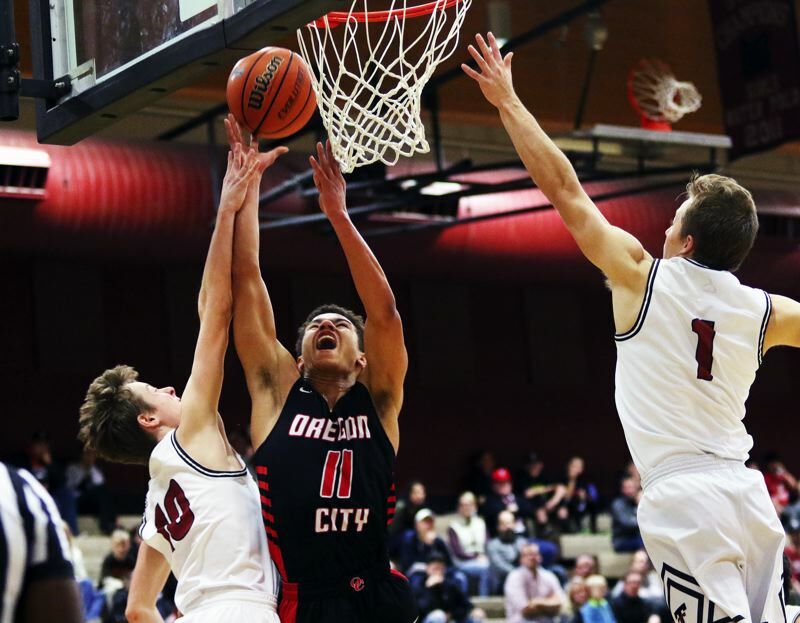 Oregon City was able to hold the lead throughout the final stanza, but it wasn't easy. Tualatin trimmed the margin to 53-52 when Dickson sank his third 3-pointer of the game, coming with 3:46 left to play. The Pioneers answered with four straight points by Remsburg, making the score 59-54 with 34.6 left to play. 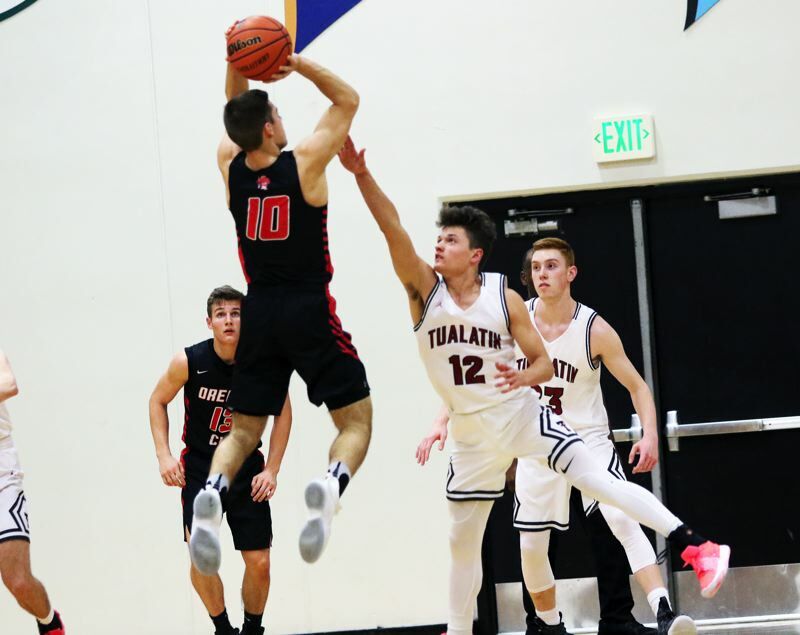 Tualatin got a pair of free throws by Steppe with 27.9 seconds remaining, but Remsburg quickly got those points back with a layup, leaving Oregon City with a 61-56 advantage with 23 seconds left to play. Miller was fouled with 10.9 seconds left to play, and he sank his first shot in the one-and-one bonus situation, making the score 61-57. Miller missed the second shot, but Rose was able to gather the loose ball. 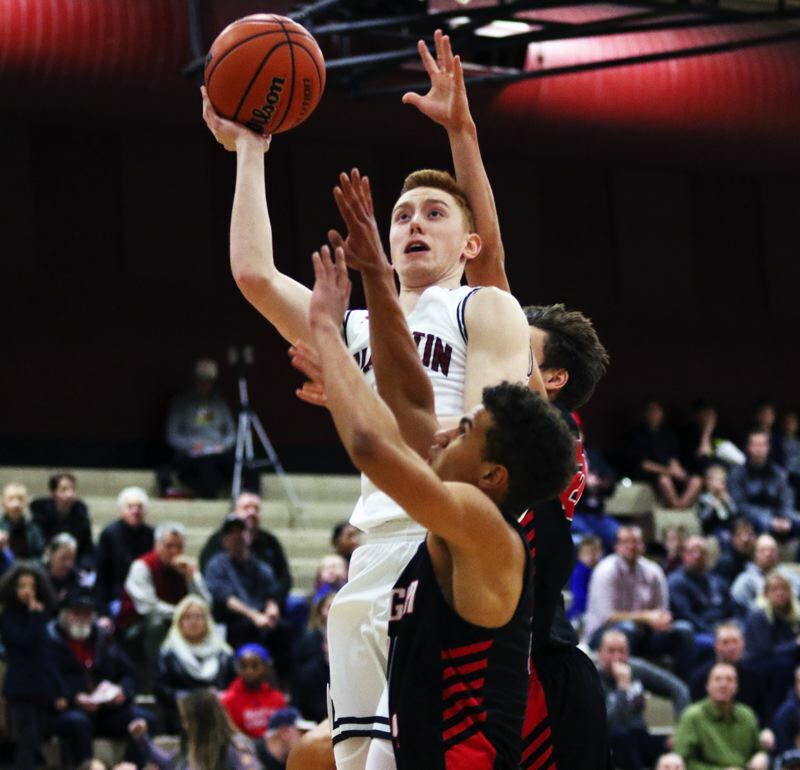 Tualatin senior Derek Leneve then sank a 30-foot 3-pointer to close the gap to 61-60 with three seconds left, but, with the Wolves out of timeouts and the clock running, the Pioneers didn't need to inbounds the ball before celebrating their one-point victory. "Oh, this was wonderful," Nova said. "A great win — great win." "It was very intense," Dickson said. "In order to get wins in games like that, we need to get stops on defense. We can't just be trading baskets. We know, in this league, which is one of the toughest in the state, you have to get stops on defense." Remsburg led all scorers in the contest with 20 points. He also had nine rebounds and a pair of steals. Nova finished the game with 14 points, coming on 7 for 7 shooting from the field. He also had five rebounds. "Their post was really good," Steppe said, referring to Nova. "It was fun battling him. He's got similar moves like me. That was a lot of fun. He's a really good kid." Best added 11 points for the Pioneers. Gettel scored six and Welch had five. 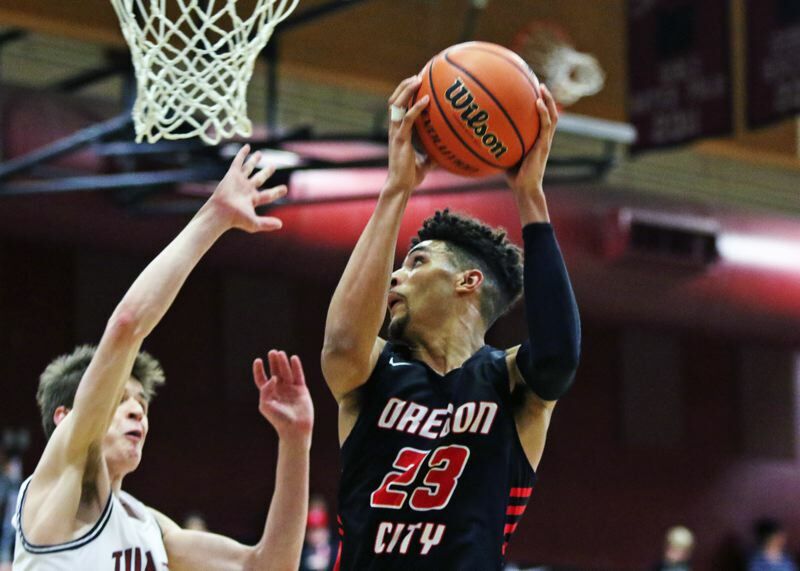 Oregon City, as a team, made 21 of 42 shots from the field, with five 3-pointers, and 14 of 20 free-throw attempts. The Pioneers, like Tualatin, had nine turnovers in the contest. "It was pretty intense," Nova said. "They've got some pretty big players. That kid (Miller), who is massive, going to OSU (for football), he's pretty good. Guarding him, and their center, was tough. They're good competition." Dickson made six of 10 shots from the field in scoring his team-high 19 points for the Wolves. Steppe had 17 points and four rebounds. Miller scored 11 points. Rose had six and Leneve added five. 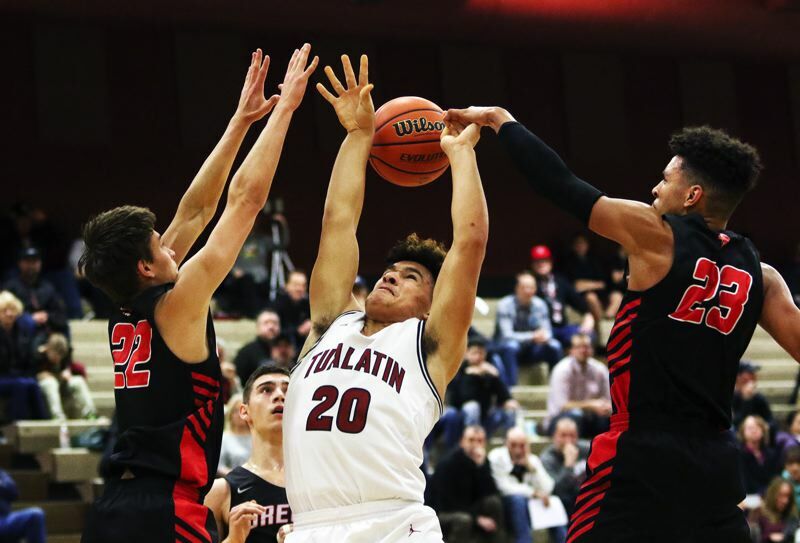 Tualatin, as a team, made 19 of 41 shots from the field, with four 3-pointers, and 18 of 20 free-throw attempts. "We had a lot of positives," Dickson said. "There were moments where we played well as a team. We need to keep that up the entire game, if we want to win games in this league. We need to play unselfishly. We need to swing the ball around and work as a team." "It was good, both teams playing hard, and that's what it's all about," Steppe said. "We just need to execute a little better. A little more selfless play. We'll come back. I'm 100 percent sure of it." Both teams will be back in league action on Tuesday. Tualatin will travel to Canby for a 7 p.m. game and Oregon City will host Lakeridge at 7:30 p.m.